Living in a city at the bank of Danube, Paul Darmogray organized (and served as the Tournament Director) two international team tournaments “Danube – River of Friendship”. The 1st Danube tournament was organized in 1984 and was won by Ukraine, and the 2nd one started in 1990 and was won by Germany. Some discripiencies related to 1st edition results presented below might happen because of lack of precise information. Starting from 3rd edition Danube Cup is called Danube Cup-Paul Darmogray Memorial to honour Paul Darmogray, initiator and TD for that event. The 3rd edition Danube Cup was won by Czech Republic. Central Tournamernt Leader was Milan Manduch (SVK). Following tradition the winner was organizer for the 4th edition. Central Tournamernt Leader was Michal Volf (CZE). The 4th edition Danube Cup was won by Russia II. Organizer for the 5th edition is Ukraine. 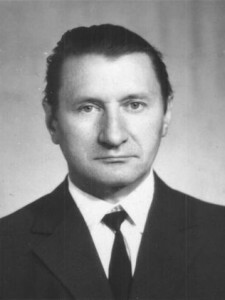 Volodymyr Galytskyi (UKR) was appointed as a Central Tournamernt Leader. The Danube is a river in the Central Europe and the Europe’s second longest river after the Volga. It is classified as an international waterway. The river originates in the Black Forest mountain range in Germany as the much smaller Brigach and Breg rivers which join at the German town of Donaueschingen. After that it is known as the Danube and flows southeastward for a distance of some 2 860 km, passing through four Central and Eastern European capitals, before emptying into the Black Sea via the Danube Delta in Romania and Ukraine. 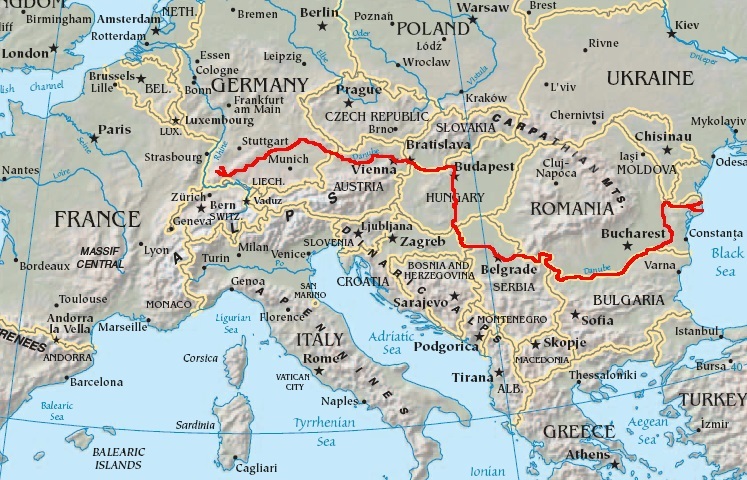 Known to history as one of the long-standing frontiers of the Roman Empire, the river flows through or acts as part of the borders of ten countries: Germany (7.0%), Austria (10.0%), Slovakia (5.9%), Hungary (11.6%), Croatia (4.4%), Serbia (10.2%), Bulgaria (5.9%), Moldova (1.6%), Ukraine (3.8%) and Romania (29.0%). (The percentages reflect the proportion of the total Danube drainage basin area). In addition to the bordering countries (see above), the drainage basin includes parts of nine more countries: Bosnia and Herzegovina (4.6%), the Czech Republic (2.9%), Slovenia (2.0%), Montenegro (0.9%), Switzerland (0.2%), Italy (<0.1%), Poland (<0.1%), the Republic of Macedonia (<0.1%) and Albania (<0.1%). The highest point of the drainage basin is the summit of Piz Bernina at the Italy–Switzerland border, 4 049 metres. Paul M. DARMOGRAY was born on October 1, 1934 in France (Paris). In 1949 his family migrated to the territory of contemporary Ukraine. After concluding his education, Paul taught foreign languages (French and German, first of all). During decades he lived in Izmail, the multinational ancient city and an important sea port in the Danube delta. Here he was teaching foreign languages for undergraduate and postgraduate students at the State Pedagogic Institute. As the great enthusiast of chess, he was a member of the city chess clubs of Odessa and Izmail, an active player, arbiter and organizer of numerous over-the-board tournaments and popular chess festivals of various levels in Odessa, Izmail and elsewhere in the South-West of Ukraine. In correspondence chess his initial activities were concentrated at the Odessa chess club, which was a key point of the Ukrainian correspondence chess during several decades. After successful play in the ICCF Master-class tournaments Paul Darmogray has achieved (twice) qualification to the European Championship Final and was awarded ICCF-IM title by the Congress in Buenos-Aires (1997) as conclusion of his performance in the international invitational Bakharov Memorial (of Bulgarian CC Federation). Due to his open-minded character, excellent knowledge of foreign languages, good organizational skills and long-term friendly relations with many chess partners in various countries Paul Darmogray was particularly active in organizing and playing of dozens international friendly matches of the Ukraine team, which he was the highly appreciated Team Captain during two decades since early 1980th. He served also as a Team Captain when Ukraine has debuted as the new ICCF member in 12th Olympiad. Living in a city at the bank of Danube, Paul Darmogray has organized (and served as the Tournament Director) two international team tournaments “Danube – River of Friendship”. The 1st Danube tournament was organized in 1984 and was won by Ukraine, and the 2nd one was started in 1990 and was won by Germany. The 1990 ICCF Presidium meeting in Bad Blankenburg (Germany) has awarded ICCF-IA title to Paul Darmogray (the first ICCF-IA for Ukraine), and he continued serving as an arbiter and appeal instance in various national tournaments until his death in 2006. Danube Cup 1: Individual results at boards from eloquery. Danube Cup 2: Individual results at boards from eloquery. Team and individual results at boards accessible at ICCF server.